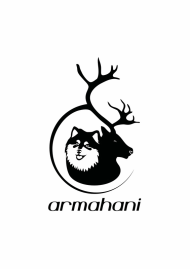 ​It has been almost two years since the last litter at Armahani, so it is with great excitement that we welcome lovely babies from our beautiful homebred girl, Lahti, to our handsome import Alaska. While I guess I should have expected it as a possibility, it sure came as a surprise when the first cream coloured puppy popped out. But to get three in a litter of four was a shock indeed. Our first born puppy, boy did we get a shock when little Frost (now Ahti) arrived! Quite the little dude, he thinks he is a bit of a bruiser, playing with glee with the rest of the pups. He was his mum's favourite of the puppies, and the one she was often seen playing with. He goes to live with Melissa and James, with Zoe the Samoyed and Logan the LabxHeeler, here in Victoria, and we hope to see him in the show ring very soon. My beautiful little girl, Twinkle (now Mischa) was such a dainty little thing with a pretty snowy coat, when she was born. For the first couple of weeks I thought she was going to be a soft gentle miss, until she started putting the big boys in their place and it was clear she had the "women-power" genes of her mother and grandmother's line! Thunder was the only black and tan puppy in the litter, and was always the strongest looking of the boys. I had my eye on him from very early on, even as others were attracted by the other boys. A real smart-aleck, he thinks he is pretty tough as he struts around. He has also developed a real look of his Grandfather Kulta around the head. He stays in co-ownership with me and is heading to the ACT to be shown and adored by Janet and her family. What can we say about Cloud (now Jari) our last born, and the funniest most adorable, most affectionate puppy you can imagine. There is no doubt many tears will be shed when this little clown leaves us. My Mum's favourite in the litter, everything he does just makes you smile. Affectionately known as the "doofus-head" he will be living with the parent's of Lahti's owner and spending regular visits with his mum and family.